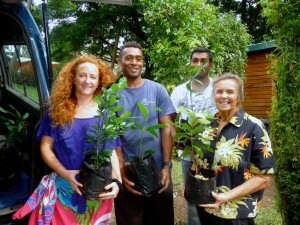 During the Taveuni Island Discovery trip in April with Kyle Waters from Toronto, Canada, we planted the mango, cumcot and avocado trees along the village end of the rainforest trek. 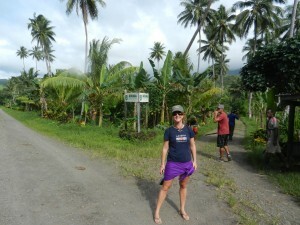 The ambition is to entice the native birds such as the endemic orange dove and silk tail back down from the mountain top so tourists can appreciate these wonderful birds. 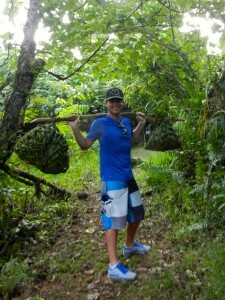 Thanks to Ron for growing these trees, great job! 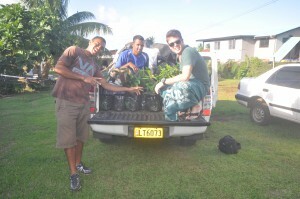 Kirsty, Manasa, Rin and Robyn load the truck full of trees, vinaka to Nakia! 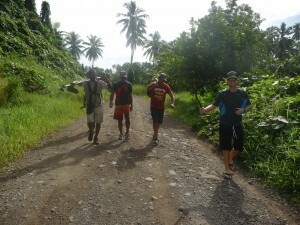 The boys head off for a day of planting at the school and along the rainforest trek. 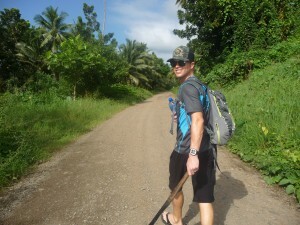 Island Spirit guest, Kyle Waters, clad in machete ready to go! 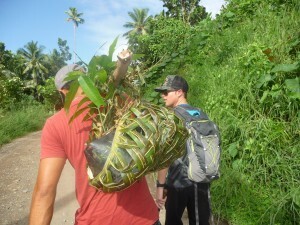 Not forgetting tradition…Kyle’s hand woven basket is used to carry two plants to the school.